Make perfect heart-shaped golden waffles (6-inch diameter) the easy way with the Kalorik Wafflemaker. A green light comes on until the unit is preheated. Add waffle batter and the green light will come back on until the waffles are ready to serve. Six temperature settings control desired crispness. The unit has decorative stainless plate for the top cover as well as a base with nonskid pads and cord storage. 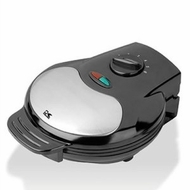 Features: Round plates waffle maker / temperature control / pilot light / easy open handle / overheat safety protection / cord storage at the bottom / non-stick coated cooking plate / FDA approved coating.